Tej Pratap, a former Health Minister in the Bihar government, has not returned home since he met his jailed father Lalu Prasad in Ranchi last week. PATNA: Besieged by a host of crises in her family, former Bihar chief minister Rabri Devi of RJD would not observe the state’s preeminent religious festival of Chhath this year. 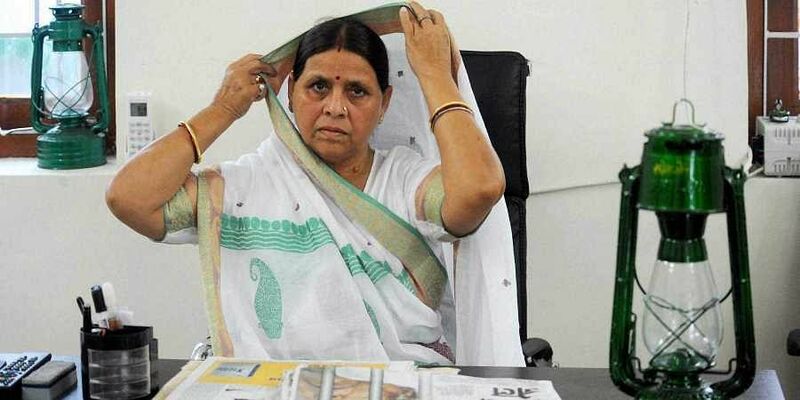 Rabri Devi, 62, who is the wife of jailed RJD chief Lalu Prasad Yadav’s wife, has been observing the three-day-long worship of the Sun God for more than three decades, barring 2014 and 2016. Her decision not to celebrate Chhath this year has made RJD supporters across the state despondent. When Rabri Devi observes Chhath, her 10, Circular Road residence in Patna remains open for party workers, who drop in to savour the prasad and get a glimpse of their leaders. Rabri Devi, who served as Bihar chief minister between 1997 and 2005, is currently an MLC and a national vice-president of RJD. “With her elder son and former minister Tej Pratap Yadav refusing to return home for the past one week after he filed for divorce from his wife, and his decision reportedly causing fluctuations in Lalu’s delicate health condition, she does not feel like observing Chhath this year,” said a source close to her family. RJD legislator Bhola Yadav confirmed Rabri’s decision but attributed it to her own ill health. “She is not observing Chhath because she is unwell. There is absolutely no other reason behind it,” said Yadav, who has been close to Lalu and Rabri for decades. Tej Pratap, 30, has stayed away from home since November 3, when he left for Ranchi to meet his father at a hospital there. Tej Pratap had filed for divorce from his wife of six months, Aishwarya Rai, the previous day, citing incompatibility. After leaving Ranchi, he headed for Varanasi even as his family waited for his return home in vain. Sources said both Lalu and Rabri Devi are keen to ensure that Tej Pratap and Aishwarya, who is the daughter of the former minister and RJD legislator Chandrika Rai, stay together and have a happy marital life. But Tej Pratap, who has been visiting temples in Vindhyachal and Haridwar after Varanasi, has made it clear that he would not withdraw his divorce petition. “I am not going to be swayed by her (Aishwarya) sweet words any more,” said Tej Pratap over phone to journalists. He also said he would return home only when his family supports his decision to divorce her and cuts all ties with four people he has accused of working against him.